Sunday night I rounded out my weekend of fun by attending the Girls with Guitars concert at the Hippodrome with my friends Kristen and Lauren. I’m glad to have made some country music loving friends in the past few years so now I can go to country concerts as well. The Girls with Guitars concert is a fundraiser for the Susan G. Komen breast cancer fund and this year featured Jennifer Nettles (of Sugarland), Sheryl Crow, Kellie Pickler, Cassadee Pope, and the band American Young. I am kind of curious about the whatever behind the scenes stuff led up to American Young being on the bill since they were never advertised as part of the show, but then were there. I don’t really care. I liked them. I am just curious. The concert was basically a bunch of people with guitars sitting up on the stage together taking turns playing music. The artists all sat in front with their backing guitarists sitting in back of them. Guitars were pretty much the only instrument on the stage save for the opening song played by Jennifer Nettles on a keyboard and one of the backing players sometimes playing a mandolin and one occasionally playing a bass, which I guess is technically still a guitar. Jennifer Nettles was the host for the evening. She is a big goof and was a lot of fun. She started things off and then everyone rotated through playing an additional 3 songs each round robin style. Then they ended the show singing a song together. Each artist shared some sort of story prior to playing each of their songs, which as you know if you read this blog is something I like. Some people would prefer if musicians would just shut up and play, but I like it when they talk to the audience. There was a lot of fun interaction between the artists, and it was fun seeing some of the younger artists seems so awed about being on stage with people they had been listening to since they were kids. It was a great concert despite the fact that I didn’t know 90% of the music that was played during the show. All of the artists played stuff mostly from forthcoming albums or recently released albums that I haven’t heard yet. I am sad that Sugarland isn’t playing together at the moment and so was wary of what the music off Jennifer Nettles’ solo album was going to be like, but I really enjoyed what she played. I was never a Sheryl Crow fan in the past for the most part, but I’m really digging her foray into country music proper so far. I wasn’t very familiar with the other 3 artists. I have never watched American Idol or the Voice, so I wasn’t familiar with Kellie Pickler or Cassadee Pope from those shows. I had heard their singles on the radio, but I didn’t know any of their other music. I wasn’t familiar at all with American Young before the concert, but as I said I did enjoy their music as well. It was an enjoyable evening, and I’m really glad I got the chance to go. Now I have some new music to look forward to listening to in the near future. Saturday night my friend Heather held her annual Halloween party. Usually it’s a joint effort between her and her roommate, but Julie is literally off sailing around the world as one of the librarians on Semester at Sea right now so it was all Heather this year. There is always a theme to the parties and you are encouraged to dress according to the theme, though that is not a requirement only coming in costume is. This year’s theme was Halloween-Con i.e. come dressed as something you would dress up as if you were going to a comic con. 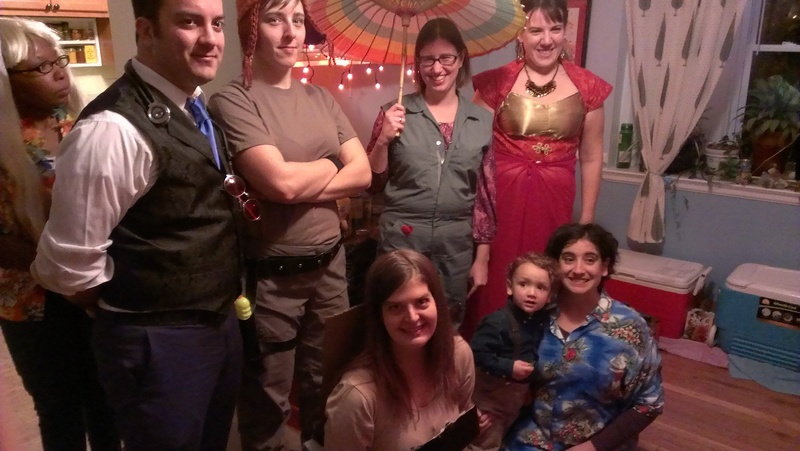 Heather planned on being Inara from Firefly and wanted to get a contingent of people together to round out the rest of the cast of characters. I will admit I am somewhat bah humbug on Halloween as an adult. I dislike spending a lot of time and/or money on a Halloween costume I am only going to wear once, especially since I no longer get to come home with a large bag of candy (plus a few pencils or toothbrushes from the lame people) at the end of the night. I figured it would be fairly cheap and easy to put together a Kaylee costume so I jumped at that. I easily found an appropriate shirt and coveralls. Heather kindly helped me with the sewing needed to take the sleeves off the coveralls and add the patches by which I mean she did it while I watched. We managed to get most of the cast, but didn’t quite make it. Our Zoe dropped out at the last minute as she had something come up and couldn’t make it to the party. We never got anyone to play Shepherd Book. I’m still giving my husband a hard time about that one because he would not be a team player and do it. He went the lame way out and created a brain slug from Futurama to attach to his head. I say lame both because it meant he wasn’t really wearing a costume and because his stubbornness meant we were short a character. No matter. We still had an awesome contingent with the cutest little Captain Mal ever! 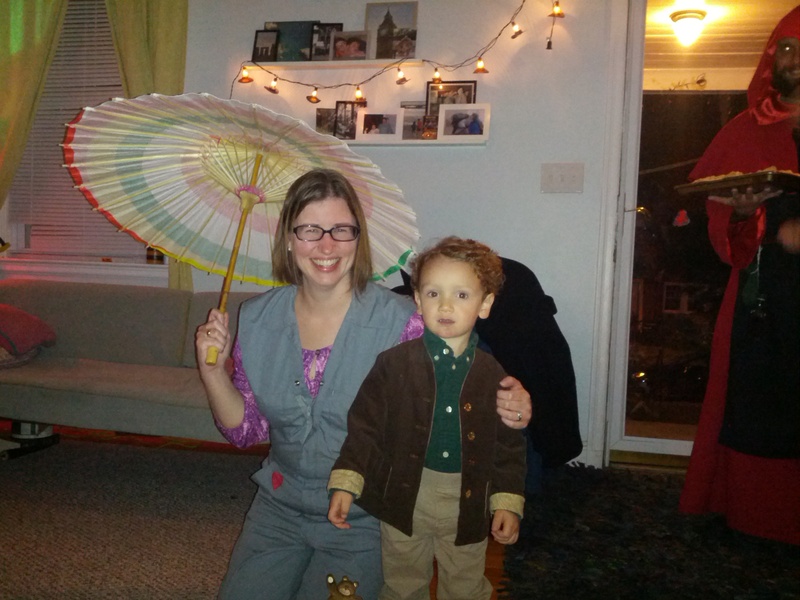 Kaylee and the cutest Captain Tightpants ever! The party also gave me a good excuse to break back out my Booze Cakes cookbook. It’s been awhile since I baked anything out of it. I figured it was a great opportunity since there were going to be a minimal number of kids at the party. 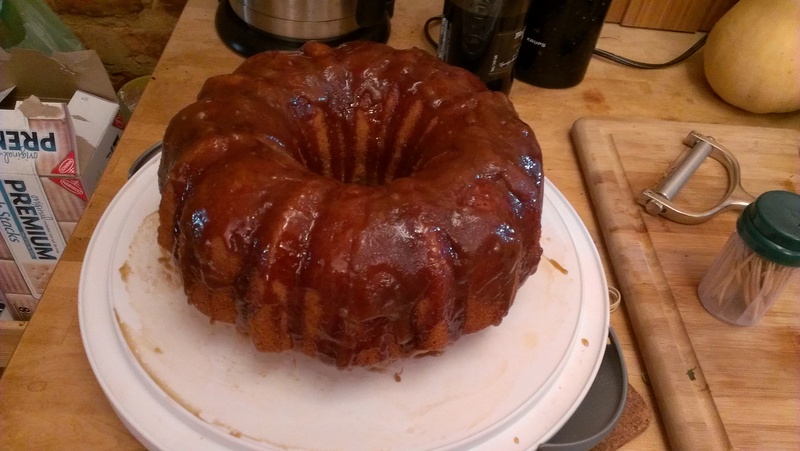 I decided to try out the rum cake recipe. It was delicious. Seriously you can’t go wrong with this cookbook. This weekend was full of fun activities that I’ll be blogging about over the beginning of this week, so stay tuned for more. Friday, a big group of friends (about 20 or so of us) got together to tackle the Rodgers Farms Corn Maze on one of their flashlight maze nights when the maze is open after dark and you traverse through it via the light from your flashlight. We won’t talk about the fact that they call it a corn maze instead of a maize maze. I mean really. Even though I really wanted to go, I was whining about how cold it was going to be out there. I dressed appropriately and it wasn’t that bad. At least one person made fun of my heavy winter coat, but I was comfortable the whole time whereas I heard other people complaining that they were cold by the end of the night. So I ask you who is the silly one in this situtation? This year’s maze was Baltimore Orioles themed as you can see from the maze map. If you’ve never been in a corn maze the goal in addition to finding your way out again is to collect things at various points in the maze. In the couple I’ve been to its involved either getting a punch or stamp on your card at each station. You can see the punches I got on the bottom of my card. 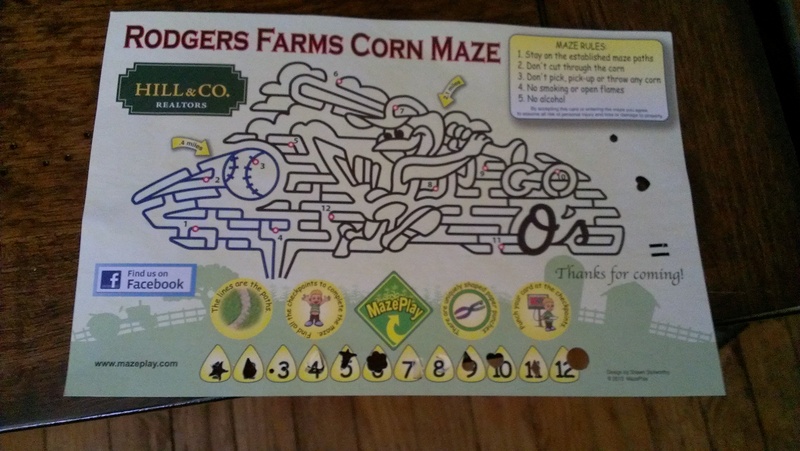 This maze also had some side game going called Farm Scene Investigators, which I think was some sort of Clue type game but none of us really understood what you were supposed to be doing with that game so we just the extra punches on the side of our card and moved on. Since there were so many of us we broke in to smaller groups. Some of the guys were trying to make it a serious competition with times between the groups and making sure there were even numbers of people on the teams. Their efforts broke down quickly as my team had way more people on it than it was supposed to and we didn’t time ourselves. I was happy to have some people on my team who were good at reading the map, as this is me trying to follow a map. I didn’t even bother trying. I just stayed in the back and followed the people in front of me who seemed to know what they were doing. Last time I was in a corn maze I feel like we wandered around aimlessly forever. I also don’t remember having a map that time either though. At any rate this time we were definitely following the map and consequently got out much faster. After we found our way out of the maze we headed back to my friend Christin’s apartment to enjoy some delicious pumpkin cake, pumpkin bread, hot chocolate, and hot apple cider. A delicious way to end a great fall evening. 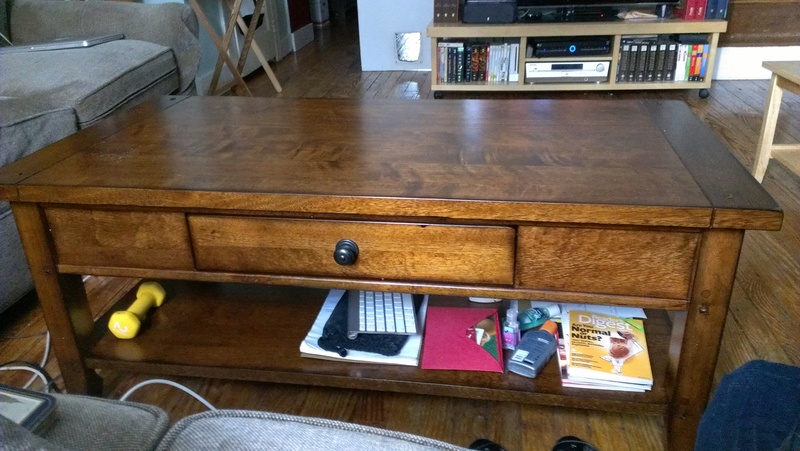 This post is for my friend Alison who upon seeing the new coffee table in our house on Tuesday night was afraid it wasn’t making me happy since I hadn’t blogged about it yet. Never fear Alison, my new tables are making me happy. As you may recall, a few months ago my husband and I purchased new sofas. I wanted to get a new coffee table at the time as well since the one we had was a cheap one from Target that some of the finish had been scratched off on. Unfortunately, we didn’t see anything that we liked in the store where we bought our sofas. I finally dragged Paul out to look at coffee tables over Columbus Day weekend as we didn’t have anything planned and all the stores were having sales for the holiday weekend. I put together a list of stores and we went looking. I was starting to fear we weren’t going to find anything because it seemed like if I liked the style I didn’t like the wood color or vice versa. Finally at the last store on my list we found something that I liked and that Paul didn’t veto. Getting him to say whether he actually likes something or not is virtually impossible. I guess the bonus of not finding the tables until the last store was that I know I’m not missing anything better somewhere else. We bought both a coffee table and a side table. I was super happy to find a side table that fit in the tiny space we have. Most side tables are much larger than that, and thus we previously had a TV tray sitting in that space. I measured it before we went shopping just in case, but wasn’t very hopeful. 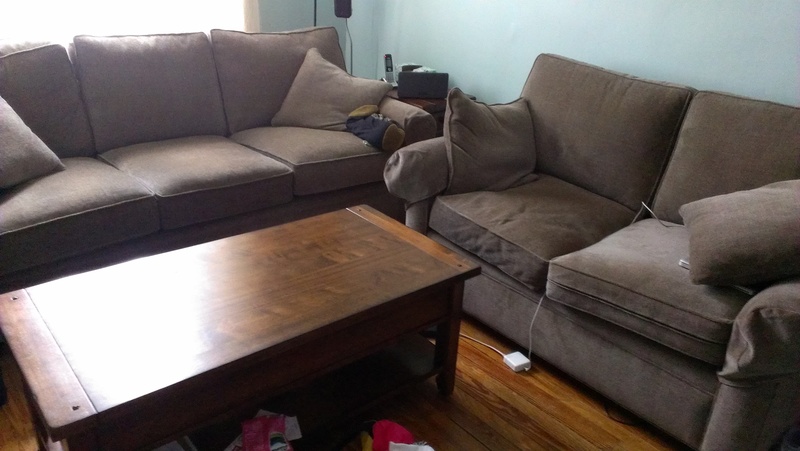 Thus I was super excited to see that the coffee table I liked had matching side tables in two different sizes, one of which was the same exact size as the TV tray I wanted to replace. I am also super in love with the drawer in the new coffee table. 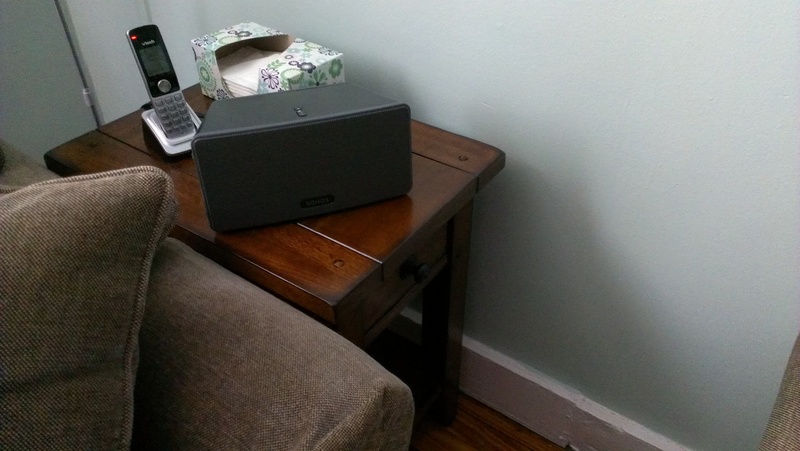 Now I can hide away all the cords and pens that were lying on the lower level of our old table as well as making them easier to get at by not burying them under piles of other junk. Speaking of junk, don’t think my coffee table is usually this clean. I cleared off a bunch of clutter in order to take these pictures. Granted half the clutter is the 6 remotes we usually have sitting on top of the table. Also not pictured are the old coffee table and TV tray that are still sitting in the middle of my living room. If anyone wants a free coffee table let me know. My only disappointment is that the matching TV stand in the collection would not work for us. The new tables are much darker wood than the old ones, so now the old TV stand really doesn’t match. I know I won’t find something that goes exactly, but I’m at least hoping I can find something in a similar wood color so that I can have at least one room in my house that looks like it belongs to an adult and isn’t furnished by IKEA. The first time I ever heard of the London-based band Daughter was a few months ago. I was talking to my friend Lindsey and she was complaining that her brother wouldn’t quit bugging her about going with him to see them play at the 9:30 Club even though she had to work that night. I said I wasn’t familiar with the band. She was surprised, and told me that I would like them. Fast forward a couple days, and I was watching an episode of Covert Affairs. That show often has music that I like in it, so I wasn’t surprised to hear a song I liked over the scene where Annie and Auggie break up. I looked it up on Tunefind, and what do you know? It turns out it was the song Smother by Daughter. That gave me a good laugh. Turns out Lindsey was right. I do like that band. Their music is hauntingly beautiful, but kind of depressing. It’s definitely not something to listen to if you’re looking for a pick me up. NPR just posted a lovely Tiny Desk Concert featuring Daughter that I highly encourage you to listen to. It’s what finally prompted me to write about Daughter here. This past Friday was my 5th wedding anniversary. To celebrate my husband and I took a long weekend trip to Virginia. Obviously we chose Virginia because Virginia is for Lovers. In reality I wanted to go away somewhere in the mountains and stay in some sort of inn or lodge where we could have privacy but also not have to deal with things like making our own food and cleaning. I originally wanted to go to The Savage River Lodge in Western Maryland. We ate dinner there a few years ago when were staying elsewhere in that vicinity and it seemed like a lovely place for a weekend getaway. Sadly, by the time I started looking for places to stay back in August they had no availability. Ditto for a million other places in Maryland, West Virginia, and Pennsylvania. Note to self: if you want to go away for a weekend in the mountains in October you need to book way earlier. 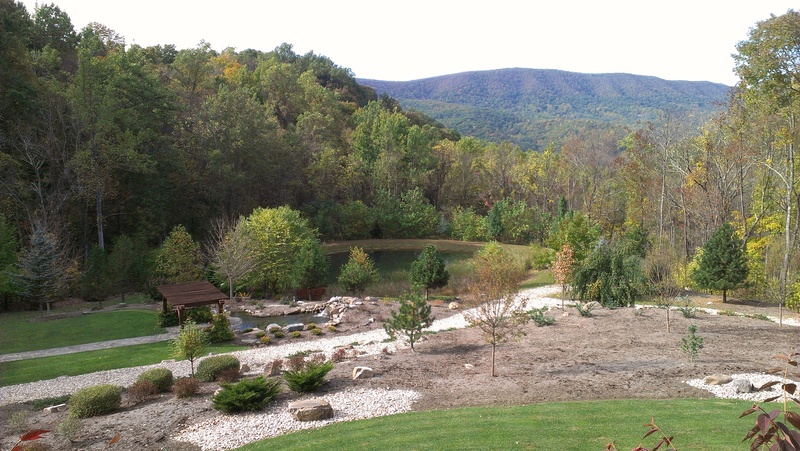 After many hours of scouring the internet I finally stumbled across the House Mountain Inn outside of Lexington, Virginia, which was just about exactly what I was looking for. 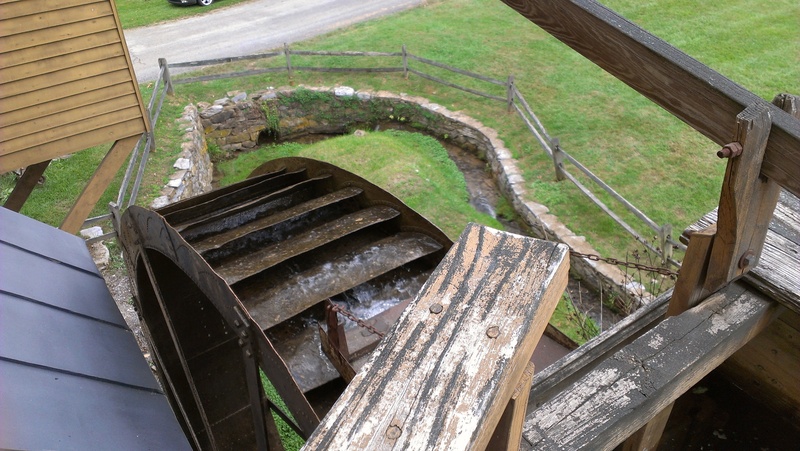 It was with in a reasonable driving distance of Baltimore, it was in the mountains, and there was on-site dining. It seemed perfect, and it pretty much was. 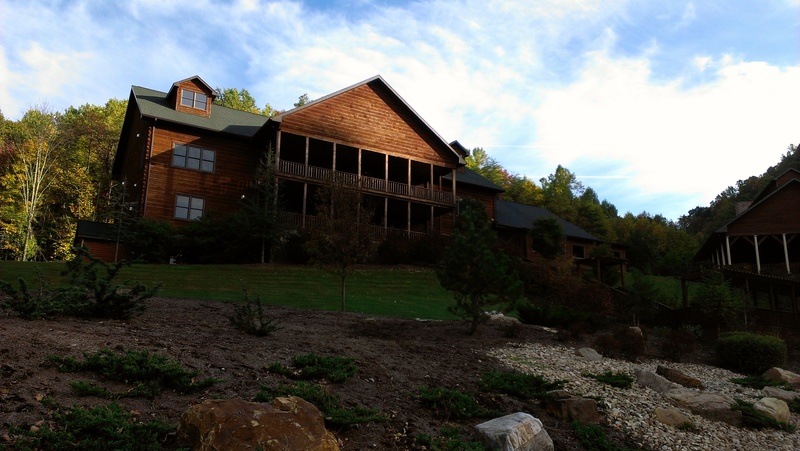 The inn is located near the base of Big House Mountain on 100 acres of land. Sadly we were just a little too early for peak leaf season. They were just ever so slightly starting to change colors while we were there. There are nine guest rooms each equipped with either an in-room jacuzzi tub or a private hot tub on the balcony. 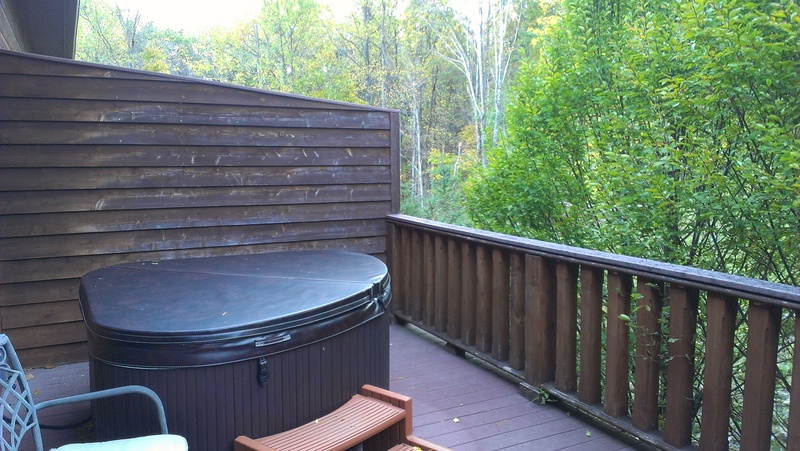 I opted for a room with a hot tub, which was lovely to sit in each night outside in the brisk fall air. Our room also had an in-room fireplace, which another great amenity that I loved. Though it mostly wasn’t cold enough for us to have it on during our stay. I did put it on for a little bit though because I love fireplaces and am always sad that we don’t have one in our house. 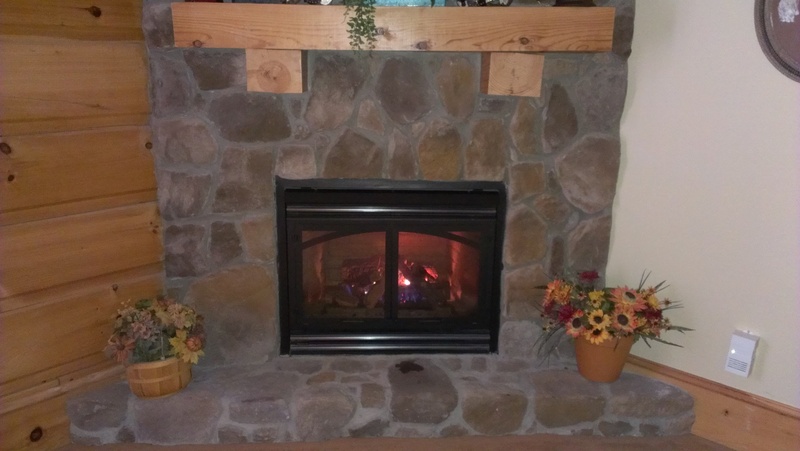 In addition to the guest rooms there is a great room on the main level of the lodge with a large fireplace and a kitchen area where you can help yourself to tea, coffee, and snacks throughout the day. There are also some board games available to play. Both breakfast and dinner are included in the price of your stay. The selections for breakfast changed each morning, but the dinner menu stayed the same. The portions for both were ridiculously huge. The fettucini Paul had came in a bowl so large it could have served at least 3 people. Even after he finished eating from it they could have served it to another table and whoever got it would have been none the wiser (not that I think they did that). I ordered the steak the first night, which itself was huge at 14 oz. Needless to say I barely put a dent in it. The second night I had stuffed shrimp, which was a much more reasonable portion. Each dinner also included an appetizer and dessert. The food was all good, so no complaints there. They also have a complimentary wine and cheese hour from 4-5 in the bar area each afternoon. We were out hiking the first day so didn’t take advantage then, but did stop in on Saturday. They had an nice selection cheeses and some sausage. Speaking of hiking there is a 6 mile loop trail that goes around the property. We hiked a portion of it after we arrived on Friday afternoon. I was told that there was a scenic overlook around the 2 mile point. We hiked up past the 2 mile marker to what was obviously the height elevation wise of the trail, but never encountered any scenic overlook as we were still under the treeline. I don’t know if there was actually no scenic overlook or if we didn’t go far enough, but we never found it. In addition to hiking there are some other activities you can book, which we did not partake in like massages and horse back riding. It also seemed like a lovely place to have a small wedding if you ever know anyone who is looking for a wedding venue around those parts. There was a banquet room as well as a covered area with a big fireplace outside for warmer times of year. We drove down on Friday morning. We went the long way distance-wise at least. It’s slightly shorter to go around the DC beltway, then take 66 to 81, but as anyone who has any familiarity with traffic on the DC beltway knows you can get stuck in awful traffic there. Thus we took the far less trafficked way out on 70 to Western Maryland and then south on 81 from there. Google maps estimated that had we gone through DC it would have been 25 minutes faster, but Google maps doesn’t know about DC traffic so we very well might have chosen the faster route. It took us about 4 and half hours including a stop for lunch and a run into Target to get me cough drops as I sadly took a cough on vacation with me. 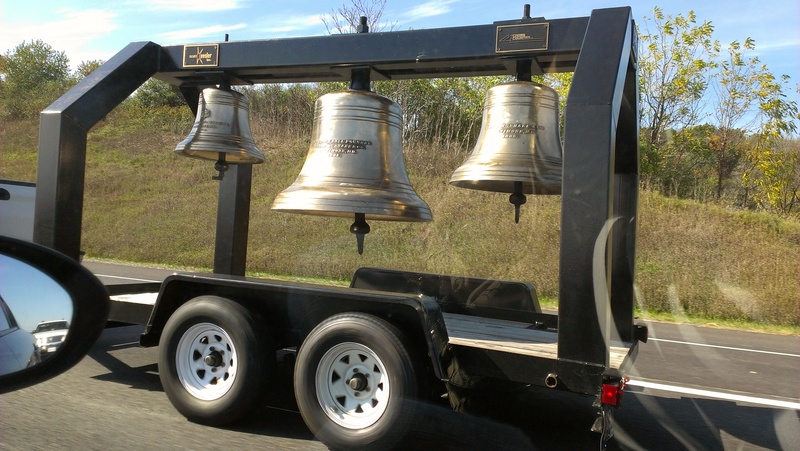 We drove by a truck transporting these bells somewhere. We were going too fast for me to catch what the inscription on them said, so I’m not sure what they are for. I thought they were interesting though, so I snapped a pic as we went by. After we arrived at the inn, as I mentioned previously, we went for a hike. Then enjoyed our dinner and relaxed in our hot tub. Saturday we headed into downtown Lexington. We went on a tour of the Stonewall Jackson house there, which Stonewall Jackson lived in only for a few short years before heading off to fight in the Civil War from which he would never return. 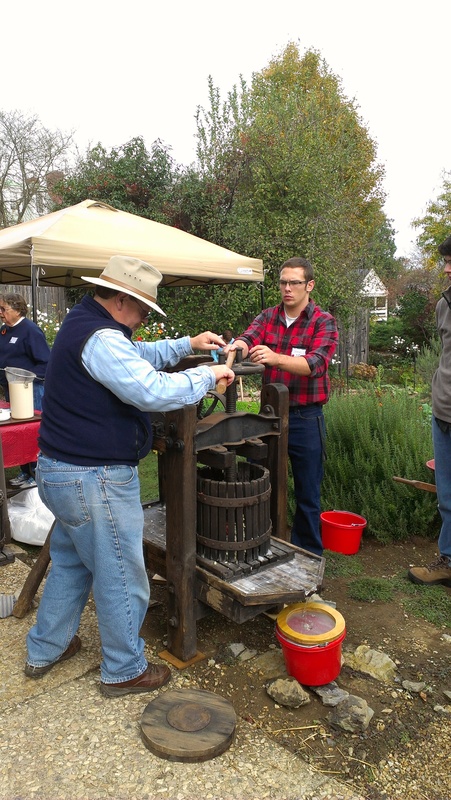 It was Apple Day at the Stonewall Jackson house so there were lots of activities going on in the garden, which would have been fun for people with kids but were not really aimed at adults, so we took a tour of the house and moved on. Lexington is the home of both Washington and Lee University and the Virginia Military Institute, whose campuses are right next to each other. We walked along the outskirts of Washington and Lee, which was quite beautiful, on our way to VMI to go to the George C. Marshall museum there. VMI is not very picturesque. 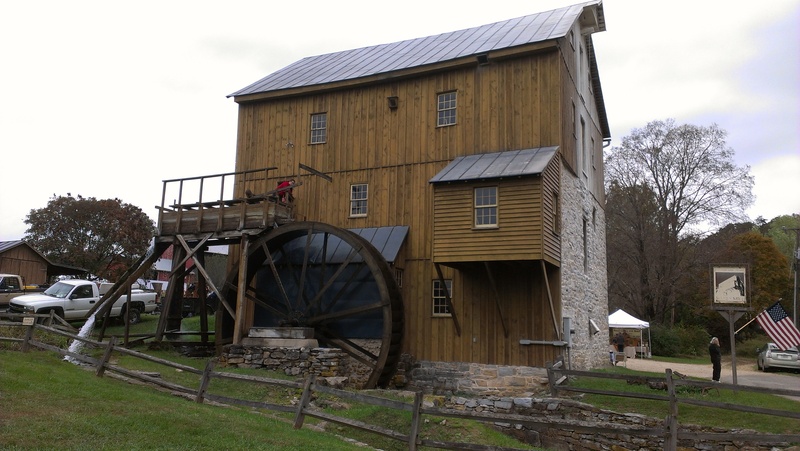 After that we headed back out of town to a place about halfway between Lexington and Staunton. 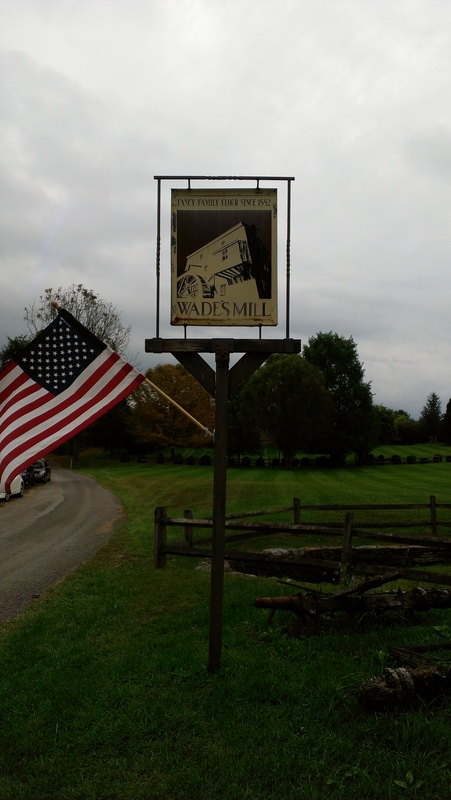 In looking up what there was to do in Lexington I had come across this place called Wade’s Mill that was having an Apple Butter festival while we were in the area. It sounded like a good fall activity to me. 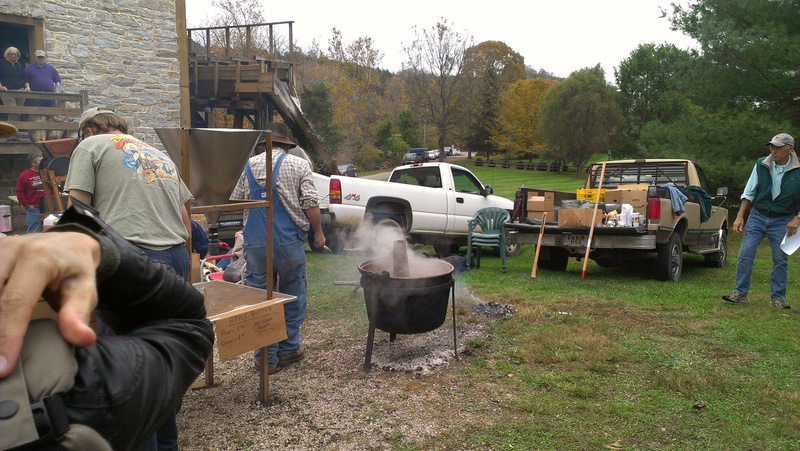 We managed to get there at a pretty good time as the apple butter which they had been cooking in a big copper pot over a fire since 6 am was just about ready to be poured into jars. 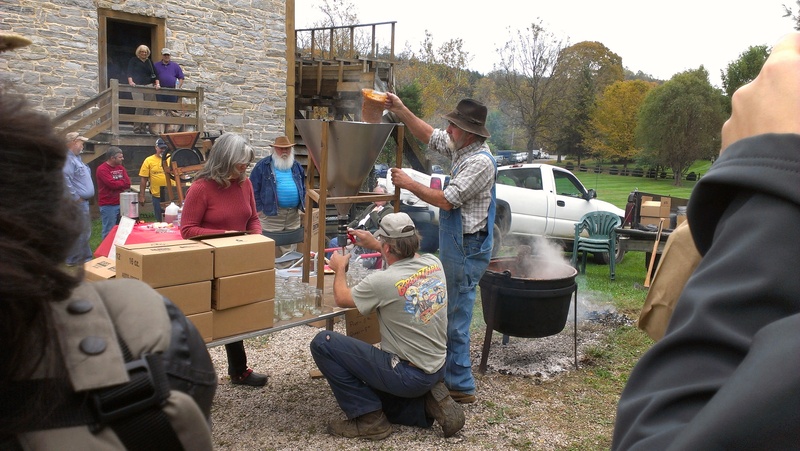 We got to watch them jar the apple butter, sample some of it straight out of the kettle, and then obviously leave with a still warm jar of it that we purchased. 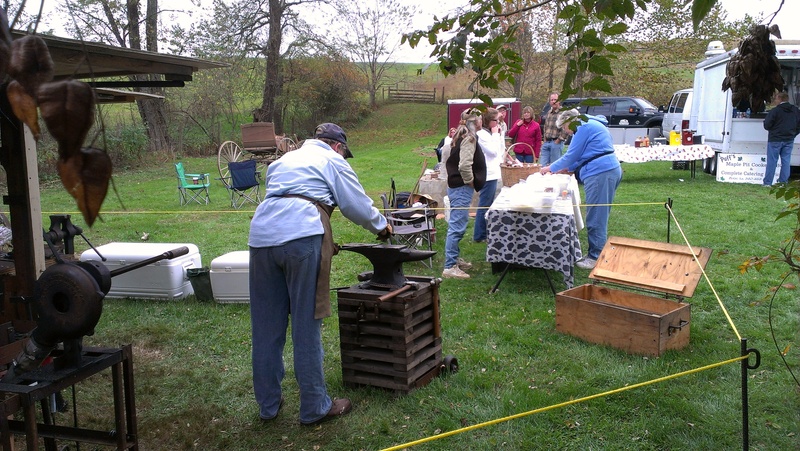 There were some other vendors selling other food and wares set up around the field as well as live music. I liked the bluegrass band that was playing when we first arrived more than the band that took over shortly after that and played for most of the time that we were hanging around. I didn’t buy any of the grains that were actually milled there, but I did also buy a jar of apple pecan butter and a jar of fig preserves. I think I need to make some biscuits to enjoy all this deliciousness on. 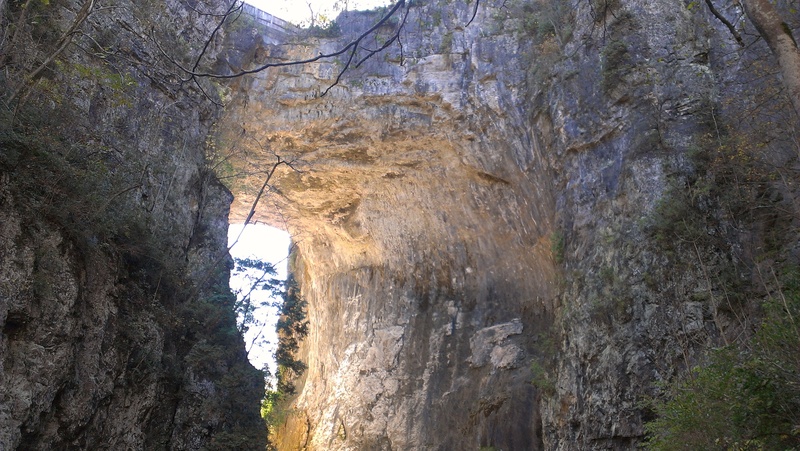 Sunday after checking out of our inn we headed about 20 miles south to the Natural Bridge. 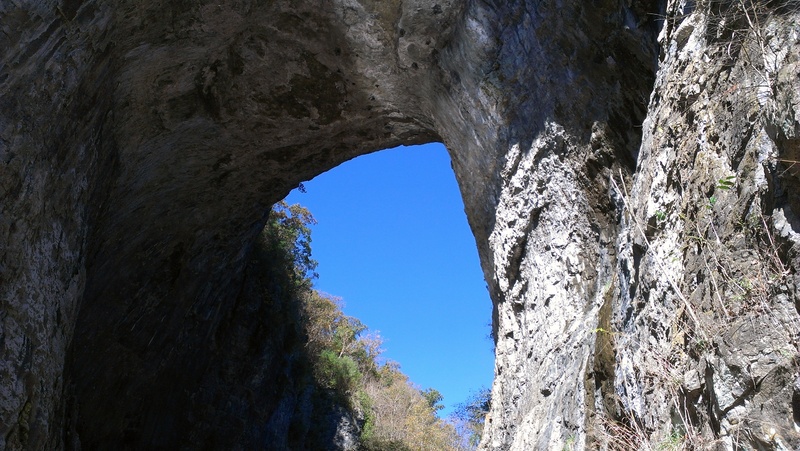 I had heard of the Natural Bridge any number of times, and figured since we were so close we should check it out. Now I am here to tell you to save your money. 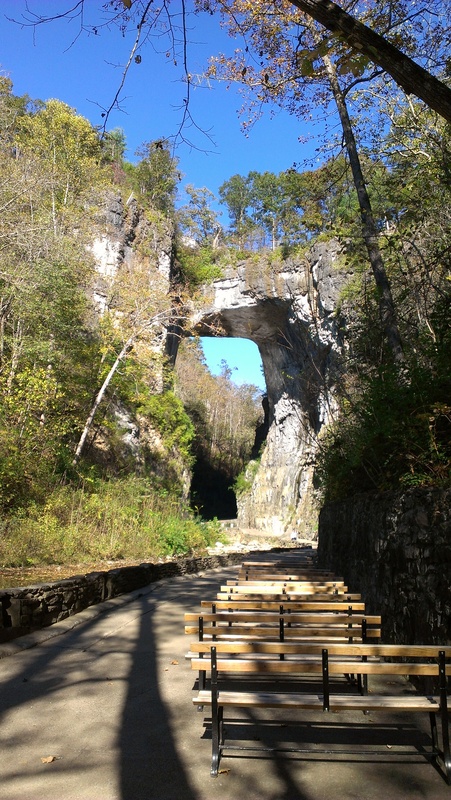 It costs just over $20 to get access to the short trail where you can see the Natural Bridge. If it had been something that I was able to just encounter in nature it would have been lovely, but it was definitely not worth the over $40 we paid for us both to see it. Especially comparing it to what I’ve seen in many National Parks for $25 a carload. We saw the bridge, walked the rest of the mile long trail to the little waterfall at the end and came back. The whole thing feels like a tourist trap taking over nature. That’s not to mention all the real tourist trap stuff built around it that we wisely did not spend our time or money on including a wax museum and Foamhenge (which if you can’t guess is a styrofoam version of Stonehenge). After that we headed home. It was a lovely fall weekend away. It’s been five years since my husband Paul and I said I do to each other. It’s hard to believe that it has been that long already. It’s been a wonderful five years with the man I love, the person who takes care of me, who makes me laugh at stupid things, and who is willing to go along with most of my crazy schemes. In all seriousness, music is obviously one of my favorite things, and I can’t think of a better way to express the way I feel about our relationship than by curating a playlist of songs about it. I mean if this were the 80s or 90s I would totally be making a mixtape for this event. I started it off with Billy Joel’s Just the Way You Are because that is the song we danced to at our wedding. The rest are love songs that mostly talk about how much better the person’s life is because the one they love is in it, which is the best kind of love song. My life is definitely better because my husband is in it. Happy anniversary. I love you.